Dubspot heads to Seattle’s Decibel Festival this month from September 24th to the 26th to join the music celebration with a series of workshops. Topics include everything from Sound Design to Music Production featuring Dubspot instructors Chris Petti, Adriano Clemente, and James Patrick. This year marks the 11 year anniversary of Seattle’s annual Decibel Festival, a five-day event taking place from September 24th through the 28th. In addition to an amazing lineup of artists from around the globe, Dubspot will be offering three full days of free EDU Sessions in partnership with Deicbel Festival. These EDU Sessions will cover a variety of topics including music production, sound design, modular synthesis and more. Check out the full schedule below along with more information about each workshop. See you in Seattle soon! The 2014 dB Conference will be taking place September 24th through the 26th (12PM until 5:30PM) at the prestigious EMP Museum at Seattle Center; home of our will call/box office, opening gala, media lounge and several of our most anticipated evening concerts. This year’s program will feature two state of the art seated venues (Level 3 and the JBL Theater) both running simultaneous activities ranging from audio/visual workshops, to panel discussions, to artist talks. The 2014 dB Conference partners include Red Bull Music Academy, EMP Museum, Roland, Ableton, Dubspot, The Recording Academy, Splice, PlayNetwork, Livid Instruments, Resident Advisor, VDMX and more to be announced. This is FREE for all. We will be reserving premium seating for festival pass holders, but all are welcome pending available space. Explore effective workflows for combining two compatible ReWire DAWs together. The main focus of this workshop will be integrating Reason and Ableton Live, as this combination is used by countless artists and producers. In this workshop, we’ll be exploring the history, concepts & programming techniques of wavetable synthesis. We’ll be featuring the popular Native Instruments Massive synthesizer as well as Propellerhead Thor. Control Voltage is an electrical signal used to manipulate the values of components in analog circuits. In this workshop, we will cover the fundamentals of control voltage as it relates to modular synthesizer systems, and how to harness to power of CV to manipulate parameters of these synthesizers. In this workshop, we’ll be exploring the endless possibilities that advance sampling techniques allow in modern electronic music production. We’ll feature Native Instruments Kontakt and showcase some of the advanced synthesis capabilities it has under the hood. Through the recent resurgence of modular synthesizers, new tools have been developed to help you integrate these synthesizers into your workflow. In this workshop, we will examine a few of these tools, including Silent Way. Reaktor allows for limitless possibilities of synthesizer and audio FX creation. In this workshop, we will be taking even the most novice of Reaktor programmers through the basics of building audio FX within Reaktor. No experience necessary. In this workshop, we will be exploring the history, concepts, and programming techniques of FM synthesis. We will be examining a few of the more popular software FM synthesizers including FM8, Operator, and the PX7. Join James Patrick in examining the groundbreaking music making equipment and software from Madrona Labs. Join us for a workshop on incorporating resampling into your production workflow, and learn how to mangle your sounds in surprising and complex ways using the technique. The focus of this workshop will be resampling using Ableton Live’s Sampler Instrument. In this workshop, Adriano Clemente we will be exploring some unique and unorthodox ways to control Ableton Live for live performance and composition. 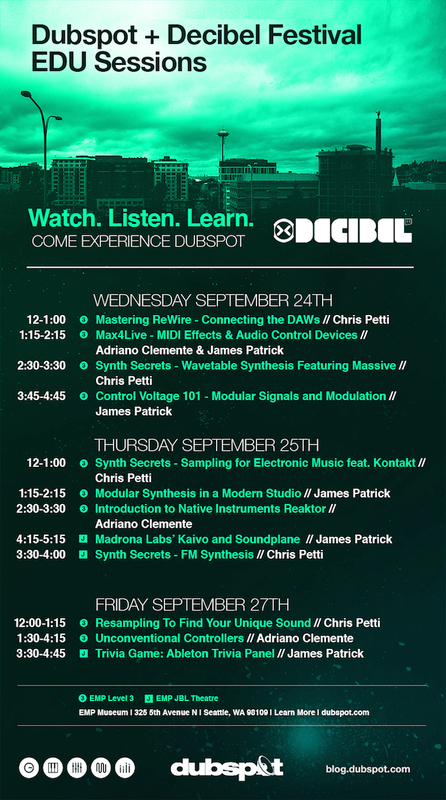 Dubspot will also be participating in a musical collaboration event w/ Splice on Thursday 9/25 at EMP Museum. Our instructors will collaborate with participants using Ableton Live 9 and Splice to collaborate on music. This is a great way to learn about some production techniques from your peers and pick up some good tips for using Splice along the way.